Eleven members of Ground Zero Center for Nonviolent Action in Washington State are on trial this week for blocking the entrance to Navy Base Kitsap-Bangor, the Pacific coast Trident submarine base that, according to Ground Zero, contains the largest concentration of operational nuclear weapons possessed by the United States. Two back-to-back trials, stemming from civil resistance actions that took place May 7 and August 8 of last year, will be heard in the courtroom of Kitsap County District Court Judge James M. Riehl, who has indicated that he will allow the defendants to talk about why they blocked the road. In November he denied the government’s motion seeking to prevent the defendants from discussing nuclear weapons or international law. In what is likely to be a narrowly circumscribed way, these defendants will attempt to put nuclear weapons on trial, even as they are being tried. In the years following the end of the Cold War, I became less and less comfortable with the concept of nuclear deterrents when there really wasn’t anybody out there that we were deterring. What we were doing was spending a whole lot of money not to be any safer. It made me mad as a former naval officer who dedicated my life to the Cold War–that’s what I did–and as a taxpayer, and as a resident of Kitsap County, because the continuing presence of the weapons at Bangor is a danger to people and the environment, even though the folks out there do as good a job as they can. In 1996 the international court of justice, which is the judicial arm of the United Nations, was asked for a judgment on whether nuclear weapons were illegal. And after a year of hearings and deliberations, they came back and said unequivocally, that the use or threat of use of nuclear weapons is illegal under international law. That came out of … the Geneva Accords. If you look at those, it’s obvious that the use of nuclear weapons is illegal under those accords. Now here’s the leap. I believe that deployment of nuclear weapons on board Trident submarines that are on alert patrol and can shoot those weapons within 30 minutes at anybody in the world constitutes a continuing threat of use. So we believe that the United States is doing something illegal. Tom Rogers’s arguments are virtually the same ones I heard in the early 1980s when I first joined the anti-nuclear weapons movement. In 1982 I traveled with several other members of Spirit Affinity Group (the nonviolent action group I had recently joined while studying at the Graduate Theological Union in Berkeley, Calif.) to western Washington to take part in a powerful nonviolent action organized by Ground Zero. Founded in 1979 by Shelly Douglass and James W. Douglass, Ground Zero organized a series of civil disobedience actions at the Bangor base, which was the Pacific port of the Trident submarine fleet that was just then coming online. 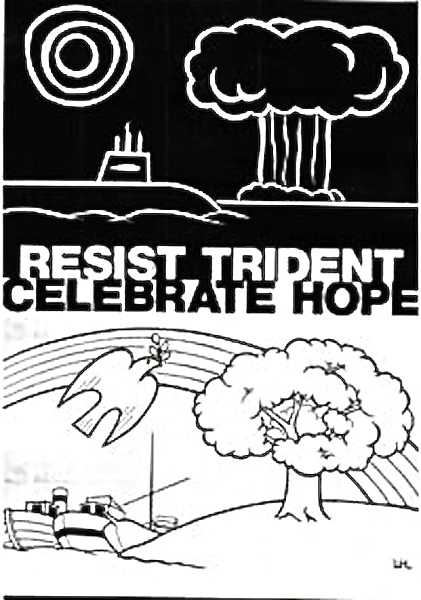 Robert Aldridge, who had quit his job at Lockheed where he was involved in the development of the Trident system’s sea-launched first-strike capability, inspired this campaign. On Thursday August 12, between 2 and 3 a.m., night watchers spotted large numbers of Coast Guard cutters stirring in the canal, and the activists were awakened. The group sprung into action, saying prayers, donning wetsuits, and boarding their meager vessels. But their publicity had preceded them. In a surprise move, the Coast Guard staged a preliminary seizure of several boats and protesters. Guardsmen carrying M-16s and handguns met them at their docks and made many arrests before the Ohio was even in sight. The boats that got away from the initial Coast Guard onslaught tore toward the “National Security Zone,” a 1000-yard perimeter around the submarine, a boundary that once crossed meant risking [a] ten-year prison sentence and $10,000 fine. Undeterred by the consequences, Ruth Youngdahl Nelson rode in her son Jon’s 16-foot motorized rubber boat as it raced from the law. A Coast Guard boat caught up with them and brought them to a halt. As a Guardsman on the cutter was about to hose the team into the sound, the 78-year-old Ms. Nelson declared boldly, “Young man, not in my America.” The Guardsman hesitated, and then lowered his hose as the group escaped for another run at the Ohio before finally being stopped and arrested. Dozens of people were arrested. I was part of the support team for my affinity group members—Terry Messman, Darla Rucker, and Bruce Turner—who now lay face down on the deck of a Coast Guard cutter, for the moment a makeshift brig. I was in a canoe with Pat Runo, another member of Spirit, and a troupe of Buddhist monks who were soulfully beating their drums. The sound had been choppy all day but now it was eerily quiet and smooth as glass. We circled the ship slowly again and again, with the drumbeat letting our friends know that they were not alone and offering a blessing to them and to the entire world, including their temporary captors. Hours later the arrestees were transferred to buses and transported to King County Courthouse in nearby Seattle. Though they faced years in jail and large fines, their federal charges were quietly dropped a few months later. This event proved pivotal for me. It gave me a glimpse into the power of nonviolent action and the state’s response to it. It demonstrated the willingness of human beings to take a nonviolent and determined stand, using the most powerful symbol they possess: their own vulnerable bodies. It even showed how such actions could help raise the visibility of one’s concern–there was enormous media coverage in the Pacific Northwest of the action but, more importantly, of the reality of the Trident submarine in our midst. As someone from Washington State, this was especially moving to me. As our friends on trial this week know, this work is far from finished. The anti-nuclear weapons movement is now in its seventh decade. In 2012 it calls each of us to find powerful, creative, and nonviolent ways to withdraw our consent from nuclearism’s still looming shadow and its central role in reinforcing systems of violence and injustice.